Over March and April this year, I was given the chance to take part in a Dyslexia Study for Glamorgan University. The study was to help understand how dyslexic’s such as myself process information, and how well they contain the information given. I had to go to a series of lectures over 5 weeks on a Wednesday. Each lecture consisted of 2 mini lectures, with 2 tests at the end. In these lectures we were split into 2 groups, one had guided notes and the other didn’t, this swapped for each lecture. The 5 weeks was a crash course in Applied Behaviour Analysis where we looked at the environmental factors that affect behaviour. Behaviour analysts identify the environmental contingencies (a contingency is a relation between events – i.e – one event occurs the other is likely to follow (hangovers is always a good example for this)) that affect certain behaviour, and work to change those so people can behave in more appropriate ways. First things first, we had to understand what behaviour is…. BEHAVIOUR IS: Things we can see, and things we can hear. BEHAVIOUR ISN’T: Attitudes/Personalities, Emotional States/Feelings or Labels. Behaviour Analysis is applied to a number of situations, such as schools, businesses, homes, communities, sport and generally every day life situations. As this was looking into how environmental contingencies affected behaviour, it wasn’t necessarily the “environment” as in trees, birds, and bees, but it was ANYTHING that occurs OUTSIDE the person, so anything that is in their environment at the time of the behaviour. A lot of the examples used was in a classroom environment and children acting up for teachers attention. When we started to talk about contingencies, and what they were, a video was shown. This video shows a child who clearly knows that if he throws a tantrum his mother should come running to him to see if he is okay. However, she doesn’t, the video is both funny and tells us about the child’s behaviour in order to get attention. We found out that when we can understand environmental contingencies, we are able to understand why people behave the way they do, and to figure out how to change the contingencies so that people can change their behaviours. Every study has influential figures, where studies have evolved and improved. The most influential Behaviour Analysis Theorist is B.F. Skinner who was recognised for the radical (modern) change in behaviourism. Others included I.P. Pavlov (classical conditioning), E.L. Thorndike (law of effect) and J.B. Watson (father of behaviourism). We looked into the A-B-C’s of behaviour, which is the basic unit of analysis called the three-term contingency that can be used to identify the environmental contingencies that affect behaviour. It is through using this, can we understand behaviour properly, as we need to know how each part affects behaviour. We started looking at the consequences of the contingency, where the consequence is a stimulus that follows behaviour, and affects the probability that the behaviour will occur again under similar circumstances. There are 4 basic consequences that determine whether a behaviour will or will not happen again. – Positive reinforcement – positive reinforcement is the addition of a stimulus that happens after the behaviour, it results in a higher chance of that behaviour occurring again under similar circumstances. For example, praise for a child raising their hand in class to answer a question. – Negative reinforcement – negative reinforcement is the removal of a stimulus that happens after the behaviour, it results in a higher chance of that behaviour occurring again under similar circumstances. For example a parent talking on the phone, the child coming in and the parent making a hand gesture for the child to be quite, and they shut up. The child is more likely to shut up when the mother does the movement again. With reinforcement the import thing is to ensure that the reinforcement given matches the amount of effort required for the behaviour (which is referred to as the matching law). Reinforcement works best, as long as it is given directly after the behaviour has happened. It helps strengthen the relationship between the target behaviour and the receipt of reinforcement. All reinforces are different for everyone, so what functions as a reinforcer for me, might not for you. Therefore it is important to determine what types of stimuli are likely to function as reinforcers, the only way to know is if the reinforcer used has a direct effect on the behaviour. A reinforcer works better if you don’t get them all the time. So if you are deprived of a particular stimulus it is more likely to function as a reinforcer than if you are satiated. This is called Motivating Operations – events that – temporarily after the effectiveness of a stimulus to function as a reinforcer, and alter the frequency of the behaviour reinforced by the stimulus. Establishing Operations (EO’s) make stimuli more likely to function as reinforcers. Abolishing Operations (AO’s) make stimuli less likely to function as reinforcers. A really interesting insight to the beginnings of behaviour analysis, I can already see how everything in the environment factors to the way that we behave, and reinforcement works for praising and promoting good behaviour, and punishment will work for trying to remove a bad behaviour. – Positive punishment – positive punishment is the addition of a stimulus that happens after the behaviour, and results in a lower chance of that behaviour occurring again under similar circumstances. For example, petting a dog in the street and having a wet smelly hand afterwards. – Negative punishment – negative punishment is the removal of a stimulus that happens after behaviour, and results in a lower chance of that behaviour occurring again under similar circumstances. For example, a child pushes another child in break and gets removed into a ‘time out’. There are some important factors that influence whether a stimulus functions as a punisher are the same ones that influence whether stimuli function as reinforcers, these are magnitude (the size), immediacy, and individual differences. We don’t like being punished, but that’s why it works, it is a fact of life, whether we like it or not, because not everything can go as we want it to. However, arranging for punishers to occur is risky, because the use of punishment can create more problems than it solves. There are a lot of risks associated with punishment – emotional reactions (lashing out), escape and avoidance (removal from class/skipping class), negative reinforcement of the punisher’s behaviour (loss of respect for the teacher), negative modelling (acting up to expectations), failing to teach an appropriate replacement behaviour. I think the best example for this is the recent Channel 4 programme ‘Jamie’s Dream School’ where a group of young people, who all have no or under 3 GCSEs, because they were expelled from school, suspended etc because of their behaviour in class they were removed from the situation of the classroom. The majority of the kids on the programme were really bright, and just needed the attention and guidance to make them motivated. The risks highlighted in the study, were proven is this programme, as all the ‘symptoms’ of a child who had been punished through school were clearly seen in the kids at the Dream School, as they failed to respect the teachers at first, until the teachers gained their respect (even though in my opinion with the highness and general presence of some of the teachers, respect should have been given instantly, especially with the likes of Simon Callow and Dr. Robert Winston), shouting out in class etc. It just show’s that punishment can have some really adverse effects, especially for students. – When reinforcement-based procedures have not produced sufficient changes in the problem behaviour. – When the behaviour is dangerous and must be stopped immediately. If punishment is absolutely necessary, it should always be used with reinforcement for appropriate behaviour. We know that reinforcement works in the right situation, but what happens when reinforcement no longer occurs? Then the behaviour will no longer occur. When the reinforcement for a previously reinforced behaviour stops, it means that the behaviour has been put on extinction. Extinction basically means that you are withholding reinforcement from what was previously a reinforced behaviour. It can happen intentionally (a cat meowing at the bedroom door at night, so you usually open the door, but you stop when he meows to stop him coming in – eventually the cat will stop meowing at the door every night), or unintentionally (a child attempts several times to answer questions in class, but the teacher never calls on him – eventually the child will stop raising his hand in class). In order to use extinction effectively, it is important that you know what is reinforcing the response, so you then have to decide if you have enough control over the person you are reinforcing to remove it. As it is easier to stop some more than others. 1. Things get worse before they get better. – Extinction burst: initial increase in response frequency after the removal of reinforcement. (this can include aggressive or emotional behaviour) – i.e = tantrums in a super market, the child might kick and scream a little before, but it could get worse when they don’t get what they want. This also relates back to the earlier video of the ‘Crying Game’. – allows the person to still get the reinforcement they want, but for an appropriate behaviour. 3. Behaviours sometimes reappear after they’ve been extinguished. – Spontaneous recovery: reappearance of a previously extinguished response. – If you are careful not to reinforce the response, it will usually disappear fairly quickly. – i.e = your child used to be afraid of the dark, and came to sleep in your room. You used extinction, by not letting your child sleep in your bed any longer, but you’ve moved house, and in different surroundings and a new environment the child comes to sleep in your bed again. After learning about reinforcement in week 1, and punishment this week, I can really see how the two work in conjunction with each other, praise for good, and punish for bad, but I can also see how punishment is not always the way forward, and you need to try and work through a situation using any means possible rather than punishment, trying to get the person to give an appropriate behaviour for praise. I can also see how effective extinction can be, especially in situations with children, and training. We revisited the three-term contingency again quickly, to cover what we have previously learnt about consequences, and moved on then to look at the antecedents. An Antecedent is essentially what sets the occasion for the behaviour to occur (or not occur). These are stimuli that precede behaviour and influence how you react. There are antecedents in every day life, and we might not even realise that these are, but they influence how we act in certain situations, such as traffic lights, police men, no smoking signs, closed/open signs etc. They instruct what happens next. There are two types of antecedents. This I feel is where it gets complicated, as it depends on the consequence that follows the behaviour, to whether the antecedent becomes an S∆ or an SD. Therefore antecedents derive their influence on behaviour via consequences. This is why consequences are stronger than antecedents in influencing behaviour. If a behaviour is followed by a reinforcer, then the stimulus preceding the behaviour will become an SD. For example – a teacher asks a question, the student gives an answer that is almost right. The teacher praises her for trying and helps her come up with the right answer. Next time the teachers question is likely to be an SD for the student to respond. So, if the behaviour is followed by a lack of reinforcement, the stimulus preceding the behaviour will likely become an S∆. For example – a teacher asks questions, a student raises her hand to answer, but the teacher ignores her, this happens several times. Next time the teacher asks a question this is likely to be an S∆ for the student to respond. When we learn what antecedent are SD’s for particular behaviours are which ones are S∆’s it means that we have learned to discriminate. We can teach people and animals to discriminate between stimuli by reinforcing particular responses n the presence of particular stimuli. The video below (Can Pigeons Read) was an example given to us about the use of discrimination between words, when a pigeon saw the word peck or twist it would follow those instructions and providing they did it right, they got a treat. The video is a good example to show the uses of discrimination. Another example we were given, was by the lecturers experience of working with children with Autism. One child always wanted to go outside, he always walked over to the door and made a gesture that meant he wanted to be let out, even when it was raining. In order to combat this problem, there was a green sign put on the door when it was okay to go outside, and when he followed his pattern by going to the door and making the gesture, he was allowed to go outside (reinforcement), when there was a red sign on the door, he was not allowed to go outside, and was refused to be let out. When organisms behave in a particular and predictable ways in the presence of SD’s and S∆’s, we say that the behaviour is under stimulus control. Now we knew the affect that antecedents and consequences have on behaviour, and that a behaviour is defined as something we can see and hear. It is time that we looked at how to further define some of the types of behavioural problems that we can encounter. Behavioural Excesses are problematic because they are inappropriate and the person shouldn’t be doing them. Some of these behaviours can also occur too often. For example, a child in a class who is quite capable of doing the work, but always asks the teacher for help. On the other hand we have behavioural deficits that are behaviours that should occur but don’t. Such as a child raising his hand if they need help, but won’t. – Is there a behavioural excess that needs to be decreased? – Is there a behavioural deficit that needs to be increased? – Is there a current behavioural repertoire on which to build, or does one need to be developed? Ways to develop behavioural repertoires can happen through a process called shaping (the development of new behaviour through reinforcement of successive approximations of the target behaviour), it can be used to develop new behaviours or change the dimensions of an existing behaviour. 1. Define the target/terminal behaviour – helps you focus on exactly where you’re headed with the shaping procedure. 2. Select a starting step – has to be a behaviour the person engages in, also has some relevance to the target behaviour. 3. Develop a tentative plan of shaping steps – the person’s progress will dictate the exact steps, but its good idea to have some approximations in mind. 4. Choose a stimulus that will function as an effective reinforcer – this should be something that can be delivered quickly, but not produce satiation quickly. 5. Reinforce successive approximations of behaviour – once an approximation reliably occurs, stop reinforcing it and move to the next approximation. 6. Carefully observe the learner to ensure you are shaping at an appropriate pace – if the learner is failing to acquire steps, you might be going too fast (try breaking the approximation into smaller steps), however failure to acquire behaviour might also mean you’ve gone too slow, and the leaner has got “stuck” on a particular approximation (try reinforcing only those approximations that show some “variability” from the previous response. An example we were given was a little boy trying to do his 5 minutes of homework but getting bored after a minute of concentrating, The parent would structure a shaping plan to increase his minutes of concentration and then rewarding him with the break he wants. Week 3 offered us a deeper and more complicated insight into why behaviours happen. Learning that the mind is under stimulus control with a lot of the things we do in daily life was quite interesting, as we rely heavily on these things to keep order to our lives, makes us seems a lot like robots! As well as the way that we can shape behaviour that needs to change, and aim for a different/improved behaviour through mediating improvements/approximations. After finding out about shaping and that can help people adopt new behaviours, there is another way that we can help people engage in new behaviours, which is called prompting. A prompt is a stimulus that is provided before (just after an antecedent or during a behaviour that helps the person engage in the correct behaviour in the presences of an SD. 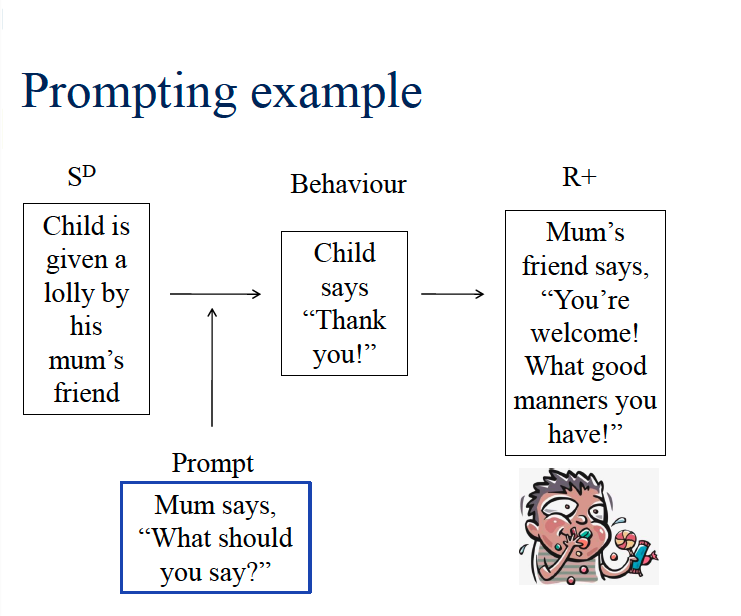 This was the example given to us, about the child who is told to say Thank You, with the mother using a verbal prompt. You hear this all the time, and with the correct reinforcement from the other adult of praise the child is more likely to say ‘Thank You’ on their own the next time it happens. When using prompting, it is being used to “support” a person’s behaviour. The goal is for the person to eventually as I said before, do the behaviour without the prompt, when the SD is presented. (which means when the SD is presented and the behaviour happens, that that person is under stimulus control). Response Prompts – prompts that involve the behaviour of another person to evoke a particular behaviour. Stimulus Prompts – prompts that involve changing an antecedent stimulus to evoke a particular behaviour. Extra Stimulus Prompts – additional stimuli presented in conjunction with the SD to help a person make a correct response. The examples given to us for the stimulus prompts was from working with children with learning disabilities, where for instance, using a within-stimulus prompt they wanted the child to pick out a certain colour from a number of cards, if the colour they wanted was larger, brighter and closer to the child, the child is more likely to pick that colour. Again with the extra stimulus prompt, if there was more of the colour on the table, the child is more likely to get it right. And as with any right behaviour, once the desire behaviour has occurred, it needs to be reinforced, as you are trying to establish stimulus control over the behaviour, so reinforcing that behaviour helps build a relationship between the SD, the behaviour and the reinforcer. Prompting is only a temporary solution, so once it occurs often you need to start fading the prompts, which means you gradually remove the prompts so the behaviour happens in the presence of an SD. Next we looked at the causes of behaviour, as there are two possible sources for why problem behaviours occur, which are Inside the person and Outside the person. The efforts to change behaviour are often much more successful when you look for the causes OUTSIDE the person, as often inside problems are genetic and you can’t change that. The way to assess and understand behaviour, behaviour analysts use a system called Functional Behaviour Assessment (FBA) which is a process where they systematically examine the A-B-C’s to help understand why people do the things they do. They help seek to identify clear, predictive relationships between events in the person’s environments and the occurrences of behaviours. What is analysed when an FBA is conducted? – Looking for things that might “trigger” the behaviour (knowing if there are any SDs that reliably predict the occurrence of behaviour), it also can tell what sets the occasion for a behaviour to occur. – Antecedents for problem behaviours can include a lot of different things. Physical characteristic of the environment, including light, temperature, noise…. We all suffer from these symptoms, especially when it comes down to doing things we don’t want to do or don’t like, such as work, coursework, going to the gym etc, and most of us react the same way. – We know what is needed to define problems in terms of behaviour (not in terms of attitudes or labels) – the assessors need to describe exactly what the person is doing when they behave. – It also is important to look for behaviours that might serve as ”replacement” behaviours. – Determining the consequences for behaviour helps the assessors understand why the behaviour continues to occur. – This tells them the purpose (or function) the behaviour serves for the person. Once assessing the problem behaviour, there are a number of potential functions that could be fuelling the behaviour. EG – You could be your in a group of friends, and your partner is making crude jokes, that you don’t find funny and offensive, but your friends laugh. He is getting positive reinforcement of the friends laughing at his jokes, but it is a behaviour that needs to change. EG – You could be shopping in a super market, and you see someone you really don’t like walking down the next lane, you purposefully avoid him or her in order not to speak to him or her. You are removing yourself from a situation you don’t want to be in. EG – rewarding yourself with some jewellery, or gadgets, or a drink or watching the TV. EG – you are watching the TV, this could be positive as it is a reward you are giving yourself, or it could be negative as you are using it as a distraction from doing work. Week 4 again, provided a more in depth idea into how behaviour is analysed, especially knowing the techniques go behind it. I feel that from learning the FBA I can maybe put these into practise to change some of my bug-bare behaviours such as procrastination and exercise. Week 5, we looked into Behaviour Change Strategies, we already learnt about ways to try and change behaviour with prompting and shaping, but this was going to be more indepth. It was important to keep in mind that people do the things they do because their behaviour makes sense to them. (It helps them get the things they want (their reinforcers)), and they deserve to have the things they want (provided those things are appropriate for them to have). A behaviour analyst’s job is to help people develop more appropriate ways to access the things they want. They use the things a person wants in order to reinforce the things the person needs to do in order to be successful. Therefore, the goal is to teach and reinforce appropriate behaviour, and not to just eliminate the inappropriate behaviour. Once identified the relevant contingencies via an FBA, strategies can then be thought of in order to change behaviour. The key is to link the results of the FBA with the strategies selected as part of the behaviour changed procedures. When this is done, “function-based interventions” has been selected. Function-Based Intervention – is a strategy for changing behaviour seeks to change the environmental stimuli that cause or maintains behaviour. These strategies, add, subtract, or change relevant antecedents and consequent stimuli, for example if your cold put on a jumper. Non-Function-Based Intervention – is a strategy for changing behaviour, but does not consider information about the environmental stimuli that cause or maintain the behaviour. These are “general” strategies with no relation to variables identified in the FBA, for example the star system in schools. 1 – Is there an antecedent that evokes the problem behaviour? If yes, can that antecedent be changed so it is less likely to do so? 2 – Are there sufficient antecedents (or prompts) to occasion appropriate replacement behaviours? If not, can they be added? 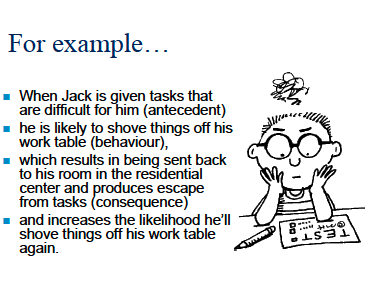 3 – What is the consequence or consequences for inappropriate behaviour? How can we arrange this consequence to occur after appropriate behaviour? We were then given tasks to determine whether strategies were function-based or non-function-based, in certain situations. SO, the last lecture we had was about self management, which to be honest I found the most useful lecture of all, as this is the one we can all really put into practise when it comes down to our goals and uni work. We all complain about wishing we had willpower and motivation, but this thinking doesn’t help us solve our self-management problems. It’s a matter of understanding our own contingencies. To understand our own behavioural excesses and behavioural deficits, we need to understand that consequences often compete with each other. Usually the stronger consequence wins, so when sizing up the competing consequences, you need to decided whether it is immediate or delayed, certain or uncertain. Immediate Certain consequences are by far the strongest, and if the two consequences are certain and immediate, then size (magnitude) might also matter. Behavioural excesses usually involve an immediate reinforcer for the problem behaviour competing with a delayed consequence. SO, what are the steps to Self Management? Identify the consequences for your self-management problems. and make sure those reinforcers are positive, immediate and certain! Identify the antecedents that might trigger problems or inhibit change. Remove antecedents for the behaviours you don’t want. For example, throwing away the Ben and Jerry’s, Hobnobs, and Malteasers so you have to go to the shop if you want to eat them. Monitor and graph your progress. Sort out a way to measure your progress and post it somewhere you will see it daily. Week 5 is probably the most useful lecture I feel, for myself that I can put into practise, especially the Self-Management lecture. Mainly because I am doing the Race For Life, and I really need to find some way to work towards that goal! I really enjoyed this experience, as it was a real learning curve for me, it made me realise how much I do rely on notes to help me through tests and exams. Learning about Analytical Behaviour was really interesting as a subject as well; as it is something that I wouldn’t normally take an interest in, but it was a good insight into how we behave, the terminology behind it, and all the stuff in-between!